As we have been informing for the last month, the CNT-AIT Salamanca has started a conflict against the telemarketing company Arvato-Qualytel. The conflict is motivated by the model of employment in this company, based on contracts through temporary work agencies Adecco and Randstad. In this way Arvato-Qualytel has the option to freely dismiss any worker by letting the contract expire, but this is not all. We can add up all the rights lost by the workers contracted by the temporary work agencies, which means no paid vacations, fewer days off if a relative is hospitalized, application of the Collective Agreement for Temporary Work Agencies instead of the one for Contact Centers and the lack of any compensation when fired. To cover stable work places under temporary contracts is clearly illegal and the work inspection has confirmed this over 6 months ago, but it is cheaper for Arvato-Qualytel to pay the penalties than to recognize what is evident: that 40 percent of the staff is contracted through a temporary work agency when they are really the employees of the company. Tired of this scam, various comrades of the CNT-AIT started a case, created a union section in the company together with workers contracted directly by Arvato-Qualytel, making demands to the company in matters of the method of employment, health and safety, breaks and salaries. The response of the company was negative and the dismissal through „expiration of the contract” of the comrades in the union who were employed by the temporary work agency, who are waiting for a court case. This is when the conflict was made public, concentrating on demands for the direct and indefinite employment of the workers contracted by the tempory work agencies and the reinstatement of the dismissed comrades. Como bien fuimos comunicando días atrás, el conjunto de la Asociación Internacional de lxs Trabajadorxs se movilizó a lo largo y ancho del planeta en múltiples centros de trabajo y establecimientos de Truck and Wheel y el grupo BMW. Es un orgullo para nuestro sindicato y para el delegado sindical despedido, comprobar como puede extenderse una lucha concreta a nivel global, a través del apoyo mutuo, la solidaridad de clase y la acción directa. 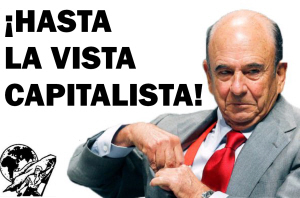 Le hemos mostrado a lxs capitalistas cómo puede propagarse un conflicto a nivel global cuando nos reprimen y despiden por ejercer nuestros derechos como trabajadorxs, rompiendo con el aislamiento y la incomunicación que desean entre lxs explotadxs del mundo entero. Esto ha sido sólo el comienzo, y vamos a pelear hasta el único final posible en este conflicto: la readmisión del compañero y el restablecimiento de su actividad sindical. attention to the problems and trying to organize. 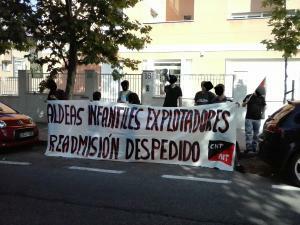 The CNT organized actions around Spain and the IWA around the world. A few other organizations and comrades also took part in solidarity actions that were held in 15 countries. than normal. We are sure that this is a result of the solidarity campaign. After more than one year, our comrade has already moved on to another city and other things. Therefore, he decided he would not like to return to his old job. We can consider this to be a personal victory for the worker, but the larger problem in the company remains. 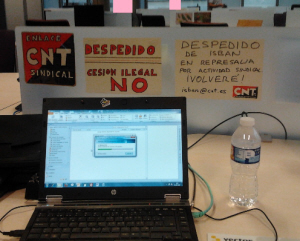 Our comrade IT workers in Spain are fighting in general against these types of working conditions and we wish them the best in their struggles. based on solidarity and show that the IWA is an effective tool for workers who want to fight against multinational corporations. We thank all the comrades who have shown solidarity in this case. On February 7, 2014, our comrade from CNT in Spain was dismissed from his job as educator at an SOS Children´s Village in Catalonia. He had begun to observe various violations of workers rights including unpaid overtime, not being able to use vacation time, some health and safety violations, etc. etc. He tried to get the employer to comply with norms and also informed the work inspection of these violations. A few days later he was fired. The CNT and the IWA consider that the dismissal was retaliation for the worker insisting that the employer comply with regulations. Action were held on the national level on Spain and solidarity was shown internationally by the IWA Sections. We are pleased to inform that recently this comrade was reinstated in his job. Condenamos firmemente lo que consideramos actos terroristas del grupo Santander, como el régimen de semi-esclavitud al que someten a decenas de miles de trabajadores no reconocidos por Isban, la venta de hipotecas y valores basura, las inversiones en armamento, la evasión fiscal, etc. Estas prácticas han terminado por ocasionar la muerte por ataque al corazón del decrépito anciano de 79 años que soportaba la "carga" de ser el más poderoso de España y parte del extranjero. Todas sus riquezas no han podido evitar que pasara del banco a la caja en un momento. 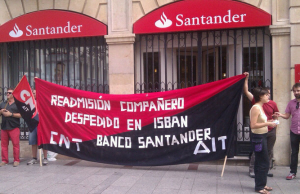 A CNT union section was formed in Isban-Santander Bank on August 19th, 2013 at Madrid. This group of precarious workers denounced illegal trafficking of staff from Panel Sistemas to Isban. More than 10,000 workers around the world are affected. They are not considered Isban workers, although they work for Isban in its facilities, with their tools and under their managers' orders. 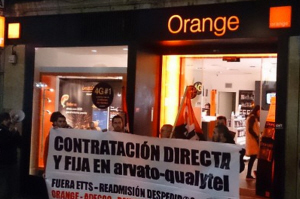 Panel Sistemas and dozens of "meat traders" companies benefit from workers renting. This way, Santander Bank has free sacking whenever they want. This makes workers ACCEPT free overtime, neverending working days, and depreciated salaries. After several weeks of fight in the company, the CNT delegate is fired by Isban-Santander Bank and sent to work at Panel Sistemas offices. 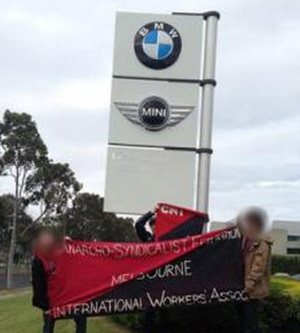 The conflict spreads thanks to the solidarity of the International Workers Association. During six months, Panel Sistemas managers KEEP pressing the worker at his new workstation, trying to make him stop claiming for decent working conditions for the staff. 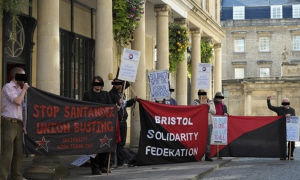 At the street, an international boycott campaign against Isban, Santander Bank and Panel Sistemas is supported by dozens of revolutionary unions worldwide.